Children learn in a variety of different ways and sometimes it’s the most simple of concepts that can have a great benefit for learning and development. One very good example is sand and water, which are both substances that children enjoy exploring and playing with under adult supervision. There are many ways in which play and learning activities can be centred around sand and water, both indoors, outdoors and on holiday, and there are various skills children can learn. The simple act of pouring water from container to container, or filling up buckets with sand, helps to improve and develop the muscles in children’s arms, as well as aiding their hand-eye coordination. Experimenting with water and sand can also help children learn about both substances – how some objects can float on water, whilst others sink and how sand absorbs water. With any water activities, it’s important for children to be properly supervised by an adult, as children can drown in even the tiniest amount of water. Containers, such as saucepans or pots that can be filled and emptied. All of these objects may seem relatively mundane to an adult, but equipped with a large bowl of water, children can indulge in a lot of exploratory play! Filling containers with water, seeing how water runs through a colander, seeing the effect of a sponge absorbing water or practicing filling pots and pans with a watering can are all interesting activities for young minds. On another occasion, you could focus their mind on seeing how different items react in water and whether they sink or float. Toy boats, wooden bricks and various other household items can be used to experiment with. Older children can be encouraged to think more deeply about what makes some items float on the surface, whilst others sink below. Activities involving learning with sand play can involve water too, or can focus simply on the sand. 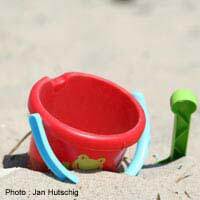 A small sand pit at home is a good introduction to sand, but otherwise you can take your child to the beach to experience sand play. As with water, all you need are a few inexpensive tools to help the activities, such as a bucket and spade and containers, such as old yogurt pots or margarine tubs, to fill up with sand or water. Children can get immersed in the art of building a castle, with or without a moat, and letting their creative imagination run wild. Much fun, and a degree of frustration, is likely to be had by children trying to fill buckets with seawater on a beach and rush it back to fill their moat. Their curiosity will be piqued by how some sand immediately absorbs water, whilst at other times they can build a moat and get it to retain water. Expect lots of questions from eager minds about what is happening! Exploratory play water is an important part of learning for children and playing with sand and water can help aid this development, so get your children involved and get them learning.